Stevens Water Monitoring Systems designs and manufactures instrumentation and systems for reliable monitoring, collection and data analysis of water and related environmental conditions. 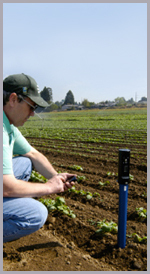 Stevens’ technology facilitates measurement of water level, water quality, groundwater, soil conditions and weather conditions. Stevens also provides proven products for certified wireless transmission of environmental data, from short-range Bluetooth technology to long-range satellite communications solutions. For more information, contact us or download the Stevens Wi-Fi POGO Soil Sensor fact sheet.